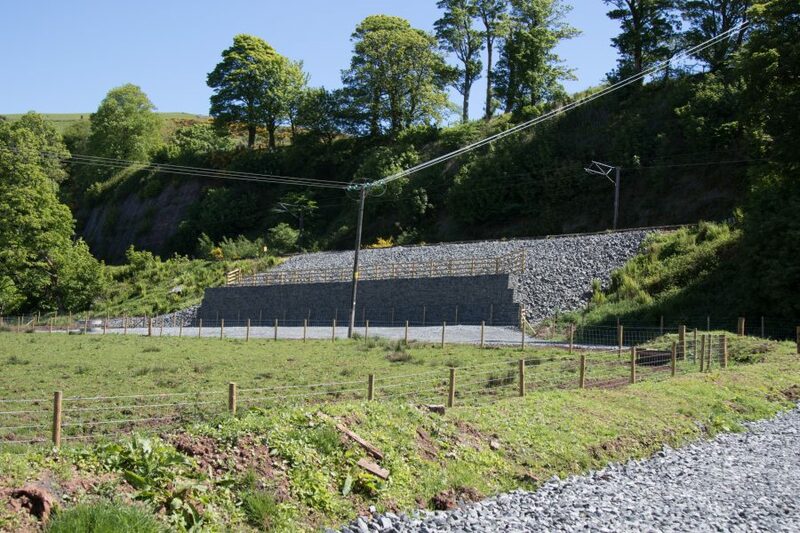 The Fairlie project, part of the CP5 Earthworks (Scotland) framework, comprised a steep, 10m high soil embankment on sidelong ground with slope movement leading to loss of the ballast shoulder. Monitoring pins installed into slope demonstrated ongoing creep of the slope. Fairhurst were commissioned to carry out an analysis of the slope and provide a geotechnical solution to reinstate the ballast shoulder and remediate the slope failure. This was carried out from Approval in Principle (Form 001) through to detailed design (Form 003) and continuing collaboration with all parties. Fairhurst carried out a ground investigation and slope analysis which demonstrated the mode of failure to be a deep seated rotational failure in soft ground conditions, with variable bedrock level (between 1.5 and 3.5mbgl at the toe of the slope). Following an options review, a gabion wall with coarse rock backfill was selected as the most appropriate solution as a requirement of Network Rail was that the line had to remain open during the works, with one weekend one disruptive possession available. The disruptive was used to install the wall foundation, then the wall and backfill was then installed while the line was open, which resulted in a significant cost saving. Due to the variable depth to bedrock at the toe, an easily adaptable foundation solution was required. The depth to bedrock also led to the potential for a significant excavation depth. Fairhurst designed a mass concrete foundation which eliminated the risk of falls from height, collapsing excavations and working in enclosed spaces.